Shoot. It's not like Apple is known for modesty. Why not boast a bit? 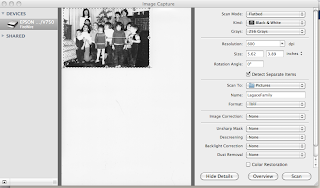 Good old Image Capture, which always had more abilities than most realized, is now a very sweet scanning app in 10.6. Apple has silently removed one of the OS X's bigger weaknesses -- crummy scanner support. Yeah, that was due to hardware vendors outsourcing device drivers to the lowest bidder, but users felt the pain all the same. For years I've made do with Epson's crummy and buggy product, and I was worried how my sweet Epson V700 would do with Snow Leopard. I didn't install anything. No apps, no drivers. Update 12/27/09: It even automatically found my 4yo networked Brother MFC-7820N - with no drivers installed! It took a long time to do the initial scan - spent about 5 minutes spinning. I was about to kill the process when it completed. Subsequent scans start fairly promptly. Page processing seems slow - and I'm using an i5! The B&W 200 dpi scan PDF results are excellent though, 4 pages at 745KB with very fine post-processing. I suspect there will be glitches though, I've seen this machine have trouble switching between acting as a scanner and acting as a printer. Thanks I didn't realize I could use Image Capture with my Epson V500. I seemed to get too much saturation and red color in faces with scans using V500 and Epson Scan in iPhoto slideshows burned w/iDVD. Perhaps the colors will be more accurate with Image Capture as well. In either event, I like the interface. Do you know whether the scanning of slides is supported for your V700. I'm thinking of buying the V500 for scanning some slides, so this would be a definite bonus.